The OM-CP-RFPRHTEMP2000A is a wireless data logger that measures and records ambient pressure, humidity and temperature. This dynamic data logger is ideal for monitoring weather data, measuring barometric pressure in high-rise buildings or monitoring storage or warehouse environments that contain sensitive material. Clinical laboratories and clean rooms can utilize the OM-CP-RFPRHTEMP2000A to measure and maintain critical pressure, humidity or temperature levels, all with one device. The OM-CP-RFPRHTEMP2000A features an LCD screen which provides instant access to the current reading, minimum, maximum and average statistics. Statistics can be reset directly on the keypad of the device, allowing you to keep track of statistics over certain time periods. This feature does not erase the data recorded, and resets the statistics count. Other features include configurable alarms, battery life indicator and wall or surface mounting options. 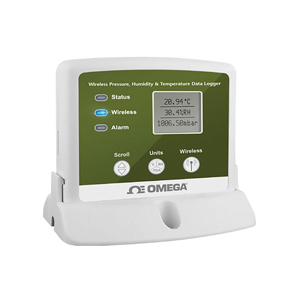 This data logger allows users to select the desired units in which the data is displayed. The OM-CP-RFPRHTEMP2000A has a wide range of units available for each channel: °C, °F, °R, K for the temperature channel, %RH, mg/mL, dew point for the humidity channel and mbar, PSI, inHg, mmHg, atm, Torr, Pa, m, kPa, MPa for the pressure channel. The unit is available for display on the LCD screen as well as in the software. The OM-CP-RFPRHTEMP2000A can be used as a standalone data logger, or used with the OM-CP-RFC1000-EXT wireless transceiver to transmit data back to a central PC. The OM-CP-RFPRHTEMP2000A transmits up to 500' line of sight to the OM-CP-RFC1000-EXT transceiver. Multiple OM-CP-RFC1000-EXTs can be used as repeaters and transmit up to 1000' line of sight to other OM-CP-RFC1000-EXTs. This allows the data to be sent over a greater distance. The OM-CP-RFPRHTEMP2000A can be used as a single wireless data logging system, or can be expanded to a large scale system, which can include hundreds of data loggers measuring different parameters such as temperature, humidity and more (additional wireless data loggers and transceivers may be required). The OM-CP-RFPRHTEMP2000A utilizes the latest software. Data can be viewed in graphical or tabular formats and summary and statistics views are available for further analysis. The software features export to Excel®, data annotation, digital calibration and more. Data Format (Display and Software): Date and time stamped °C, °F, °R, K for the temperature channel, %RH, mg/mL, dew point for the humidity channel and mbar, PSI, inHg, mmHg, atm, Torr, Pa, m, kPa, MPa for the pressure channel. 참고: Comes complete with 9V lithium battery. Operator’s manual, Windows software and USB interface cable are included with the OM-CP-RFC1000-EXT wireless transceiver package (required to operate the data logger, sold separately). Australia, Austria, Belgium, Bulgaria, Canada, Chile, China, Columbia, Croatia, Cyprus, Czech Republic, Denmark, Ecuador, Estonia, Finland, France, Germany, Greece, Honduras, Hungary, Iceland, Ireland, Israel, Japan, Latvia, Liechtenstein, Lithuania, Luxembourg, Malta, Mexico, New Zealand, Norway, Peru, Poland, Portugal, Romania, Saudi Arabia, Singapore, Slovakia, Slovenia, South Africa, South Korea, Spain, Sweden, Switzerland, Thailand, The Netherlands, Turkey, United Kingdom, United States, Venezuela, Vietnam.